Fast foods can be prepared quickly and are gaining popularity as these are emerging as alternatives for home-cooked meals. Entry of international food chains, presence of expatriate population, growing number of tourists and changing food preference would spur the Saudi Arabia fast food market forecast revenues over the coming years. Take away outlets are the major revenue generating distribution channels followed by full service outlets in the country on account of better servicing and availability of different flavors. Central region including Riyadh held the highest Saudi Arabia fast food market share in 2016 as it inhabits hefty share of expatriates and working population of the country. The Saudi Arabia fast food market report thoroughly covers the Saudi Arabia Fast Food market by types, distribution channels and regions. 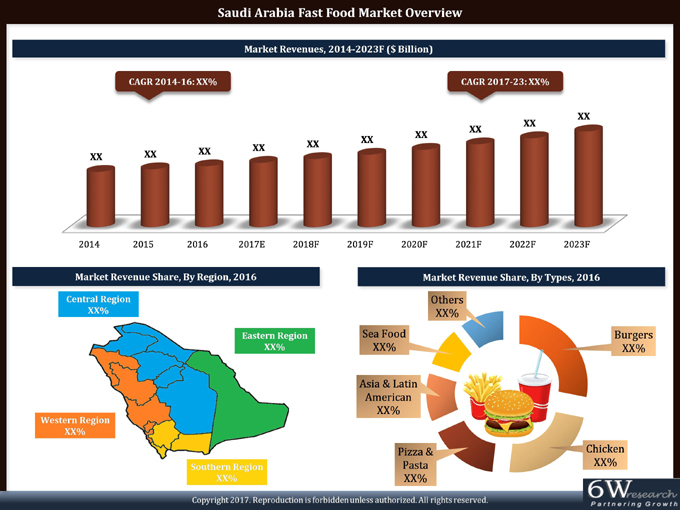 The Saudi Arabia fast food market outlook report provides an unbiased and detailed analysis of the on-going Saudi Arabia fast food market trends, opportunities high growth areas, market drivers which would help the stakeholders to device and align their market strategies according to the current and future market dynamics. • Historical Data of GCC Fast Food Market Revenues and Volume for the Period 2014-2016. • Market Size & Forecast of GCC Fast Food Market Revenues and Volume until 2023. • Historical Data of Saudi Arabia Fast Food Market Revenues and Volume for the Period 2014-2016. • Saudi Arabia Fast Food Market Size & Saudi Arabia Fast Food Market Forecast of Revenues and Volume until 2023. • Historical Data of Saudi Arabia Fast Food Market Revenues, by Types for the Period 2014-2016. • Market Size & Forecast of Saudi Arabia Fast Food Market Revenues, By Types until 2023. • Historical Data of Saudi Arabia Fast Food Market Revenues, By Distribution Channel for the Period 2014-2016. • Market Size & Forecast of Saudi Arabia Fast Food Market Revenues, By Distribution Channel until 2023. • Historical Data of Saudi Arabia Fast Food Market Revenues, By Regions for the Period 2014-2016. • Market Size & Forecast of Saudi Arabia Fast Food Market Revenues, By Regions until 2023. • Saudi Arabia Fast Food Market Drivers and Restraints. • Saudi Arabia Fast Food Market Trends and Developments. • Saudi Arabia Fast Food Market Overview on Competitive Landscape. 13.7. Hardee's Food Systems Inc.
13.8. Buffalo Wild Wings, Inc.